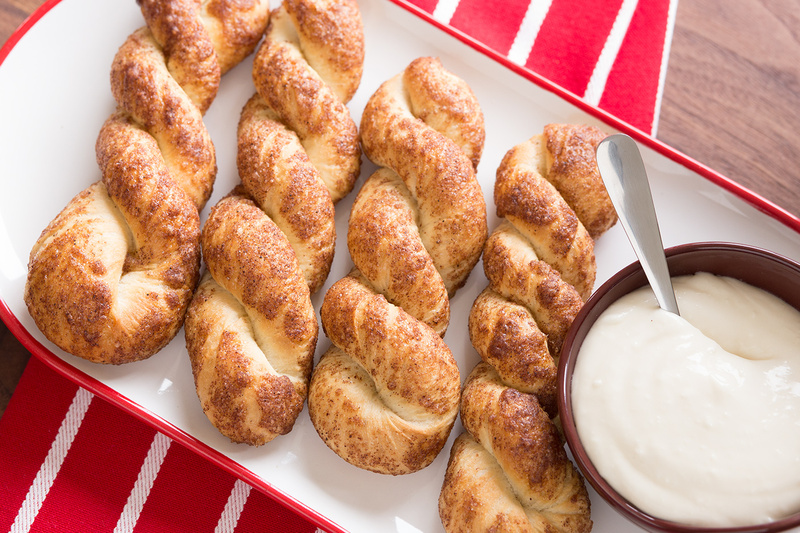 These delicious twists will satisfy any sweet tooth. Spray counter lightly with cooking spray. Roll each roll into a 14 inch rope. Roll each end in opposite directions 3 or 4 times. Pick up and pinch ends together. The dough will twist. Combine sugars, cinnamon and allspice in a deep plate. Place butter in another deep plate. Dip the twisted dough in melted butter and then sugar mixture, coating well. Place on sprayed baking sheets. Cover with sprayed plastic wrap and let rise until double in size. Bake at 350 degrees F 15-20 minutes. Combine dip ingredients and serve dip with twists.